The beginning of the first article of Part I of a manuscript of "Kitab Al-Tassrif Liman Aajaz an Al-taaleef" authored by Abul Qasim Khalaf ibn Abbas Al-Zahrawi (Albucasis, Bucasis, Zahravius, 936-1013 AD). The page shows his definition of medicine, quoted from Al-Razi, as the preservation of health in healthy individuals and its restoration unto sick individuals as much as possible by human abilities . A 19th century edition of Al-Razi (Rhazes, 854-925 AD )'s book on "The Benefits of Food and the Avoidance of its Harmfulness". 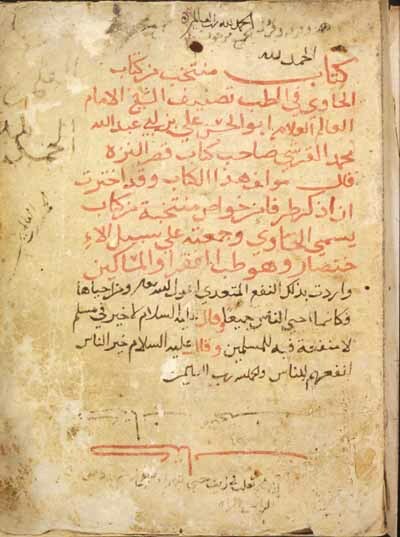 A copy of Ibn Sina (Avicenna, 980-1037 AD) 's book on the Avoidance of the General Bodily Harmfulness in Human Beings is also included as a marginalia. The book of "Selections from theContinens of Al-Razi" compiled by Abu Al-Hasan Ali ibn Abi Abellah Al-Quraishi for the aim of spreading medical knowledge and health education thus fulfilling guidance from Quran and Sunna as stated in this title page.